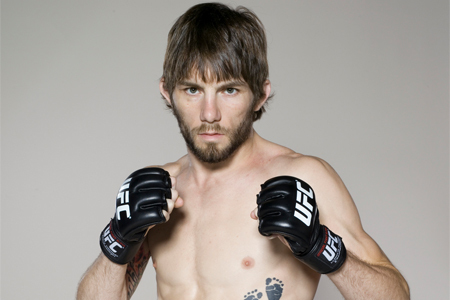 With only three days remaining until showtime, the UFC announced the preliminary bout between Johnny Bedford (Pictured) and Mitch Gagnon has unexpectedly exited stage left. The organization did not confirm the cause of the scrap’s cancellation from “UFC on FOX: Evans vs. Davis,” but one man’s loss is another man’s gain. The heavyweight shootout with Lavar Johnson and Joey Beltran was subsequently promoted to FUEL TV’s live broadcast in its place. The three-hour show begins at 5PM ET/2PM PT and will lead directly into the UFC’s return to primetime television, which starts at 8PM ET/5PM PT. As of now, the only fight not confirmed for live viewing is the brawl between Dustin Jacoby and Chris Camozzi. It’s possible their middleweight contest could be made available for streaming on the UFC’s Facebook page. United Center in Chicago, Illinois hosts Saturday’s festivities. Light heavyweights Rasahd Evans and Phil Davis will headline the freebie fight card.